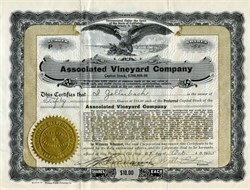 RARE stock certificate from the Associated Vineyard Company issued in 1925. This historic certificate was printed by the Pernau Printing Company and have an ornate border around them with a vignette of an eagle. This item has the signatures of the Company’s President, Walter E. Dom and Secretary (C. W. Severance) and is over 91 years old. The certificate is issued to and endorsed on the back by Crown Zellerbach Founder, Isadore Zellerbach. The Associated Vineyard Company was incorporated on February 9, 1925. 1905 The Columbia River Paper Company merges with the Crown Paper Company in Oregon City to become the Crown Columbia Paper Company. 1914 The Crown Columbia Paper Company merges with the Willamette Pulp and Paper Company, forming the Crown Willamette Paper Company. 1924 Zellerbach Corporation of San Francisco was founded by Isadore Zellerbach. 1928 Zellerbach Corporation of San Francisco and Crown Willamette unite to become Crown-Zellerbach, a forerunner in the paper and pulp industry. 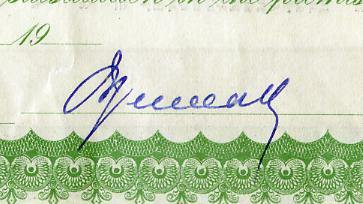 1986 Crown-Zellerbach Corporation is bought out by the James River Company. 1997 James River and Fort Howard MERGE to form the Fort James Corporation in Illinois. 2000 Fort James is acquired by Georgia-Pacific Corp., making Georgia-Pacific the leading global producer of tissue products.